Round 10: Chain 5 (counts as first dc and chain 4 space), skip next three single crochet, double crochet in next single crochet, chain 4, skip next three single crochet, double crochet in the next single crochet around. Round 15: Chain 5, skip next three single crochet, double crochet in next single crochet, skip next three single crochet, chain 4, double crochet in next single crochet around. Round 18: 2 single crochet in next single crochet, single crochet in next two single crochet. Note – this increase begins the brim. Slip stitch in next single crochet and finish off. Cut gross grain ribbon accordingly and sew ends together. 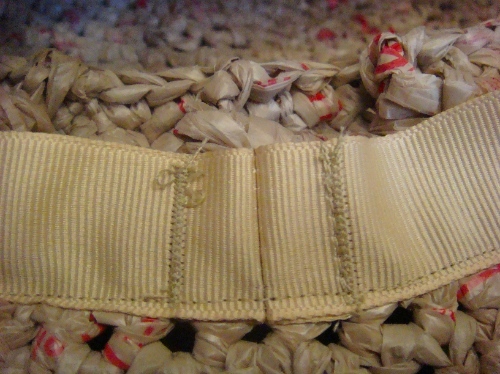 In the photograph, the extra steps of reinforcing the ends by machine sewing seams and then hand stitching ends together were taken. Machine sew bottom edge of ribbon to hat using a very short straight stitch. Note – double-check to make sure top edge of ribbon does not show through the holes of the chain 5 spaces before sewing. I seriously love this! 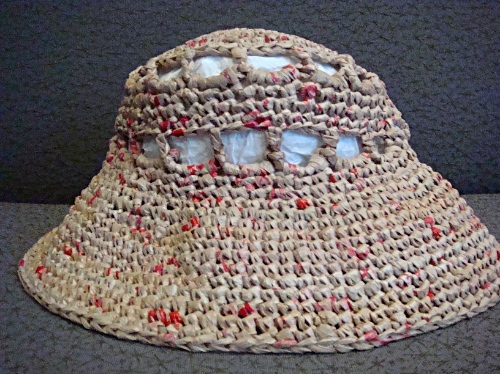 I have been wanting to make myself a upcycled plastic bag hat for some time and this is perfect for gardening! Thanks for sharing this great project. I have a plarn hat myself. So lovely to see that other like this too. very pleased to see this and the write up in the media too. 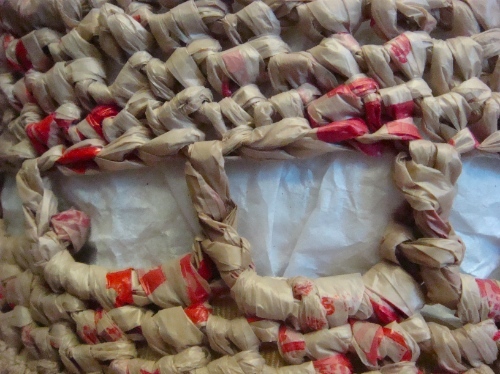 i have an artist friend in Tasmania, Nicole Johnson who has been working with this material exclusively for a decade.